The listing would be the first by a UK carmaker for years, following the sale of brands such as Jaguar, Bentley and Rolls-Royce to foreign owners. Analysts say the firm, which also on Wednesday posted half-year profits of £42m, would be worth up to £5bn. Its main shareholders are an Italian investment fund and Kuwaiti investors. The carmaker said it would initially float a minimum of 25% of the company. Chief executive Andy Palmer told the BBC that some shareholders would “cash out” their investment. 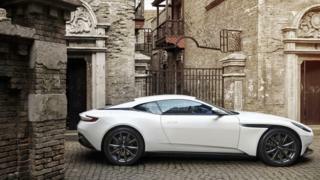 He described the plans as a “key milestone” in the history of the company, and said a luxury brand like Aston Martin was “impervious” to any trading uncertainties caused by Brexit. Despite an illustrious history and a brand name synonymous with 007 films, Aston Martin has struggled for decades to make a profit. But under Mr Palmer, a former Nissan executive, the company has been broadening its product range and has moved into new areas. The company is involved in projects to build an electric flying car, luxury homes in the US, and even a personal submarine. “We are a luxury company and not just a car company,” Mr Palmer told Radio 4’s Today programme. It expects full-year sales for 2018 to rise to between 6,200 and 6,400 units, and in the medium-term it aims to build nearly 10,000 in the 2020 calendar year. Part of the turnaround strategy strategy involved targeting female buyers – no easy task given the company has sold fewer than 4,000 cars to women in its 105-year history. He said he was unconcerned that the stock market listing would come ahead of Brexit and possible trading uncertainties. “The benefit of being a luxury company is we are relatively impervious to those kind of changes,” he told the BBC. Aston Martin exports 25% of its car to the European Union. “We’d probably benefit from a weaker pound,” he said. However, he said the carmaker was increasing its stockpile of engines, made in Germany, from three to five days “just to live a little bit of insulation” against Brexit disruption. Hargreaves Lansdown senior analyst Laith Khalaf said Aston Martin’s stock market value could be about £4-£5bn, putting it near the top of the FTSE 250 share index. He said the success of Ferrari’s flotation in New York boded well for the UK company’s plans and underlined investors’ appetite for such luxury brands.